The new animated comedy adventure DuckTales will premiere in a one-hour television movie to be presented for 24 consecutive hours, Saturday, August 12 (beginning at midnight EDT/PDT), on Disney XD. Then, the series will debut with two new episodes Saturday, September 23 (7:00 a.m., 11:00 a.m., 2:00 p.m., 5:00 p.m., 8:00 p.m., 10:30 p.m. EDT/PDT). Each will also be available on the Disney XD app and Disney XD VOD on these same dates. For the raft of DuckTales fans around the world, the August 12 movie is commonsensically titled "Woo-oo!." The September series premiere coincides with the 30th anniversary of the original Emmy Award-winning series. 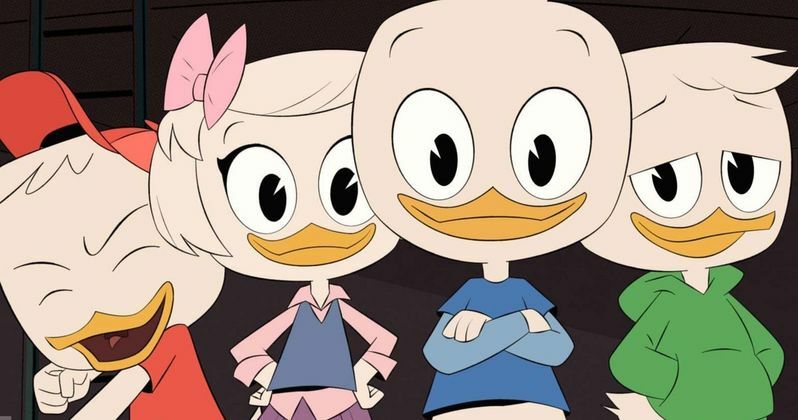 Beginning this year, DuckTales and its "Woo-oo!" movie will reach far and wide in 34 languages in 162 countries on Disney XD channels and Disney Channels worldwide. A paddling of ducks helped announce the television movie premiere date today on the official DuckTales Facebook page, which also debuted the series opening title and new rendition of the iconic DuckTales theme song. Written by Mark C. Mueller, the song is performed by singer/songwriter Felicia Barton (Dancing with the Stars) and produced by Emmy Award-winning Michael 'Smidi' Smith (Coldplay, Sia, Britney Spears) and composer Dominic Lewis (Rough Night, Fist Fight). It will be released by Walt Disney Records on Friday, June 23. The DuckTales: All Ducked Out! avatar creator is set to launch in July on the Disney XD app and on Disney LOL, with games rolling out thereafter; the "original angry bird" Donald Duck will be featured in the popular digital game Angry Birds beginning Thursday, August 3; and new DuckTales print and e-book titles including comics from master licensee IDW will be available as a San Diego Comic-Con exclusive in July, followed by a mass roll-out. Then, starting in January 2018, Disney Press will release a slate of titles including a doodle book, joke book and guide book written by the characters in the television series. Featuring a distinct animation style inspired by the classic Carl Barks' comic designs, DuckTales chronicles the high-flying adventures of Duckburg's most famous trillionaire Scrooge McDuck, his mischief-making triplet grandnephews, Huey, Dewey and Louie, temperamental nephew Donald Duck and the trusted McDuck Manor team: big-hearted, fearless chauffer/pilot Launchpad McQuack; no-nonsense housekeeper Mrs. Beakley; and Mrs. Beakley's granddaughter, Webby Vanderquack, resident adventurer and the triplet's newfound fierce friend. The story unfolds as Donald Duck reluctantly takes Huey, Dewey and Louie to the home of their reclusive great-uncle Scrooge McDuck. Enthralled by their once-legendary great-uncle and the wonder of McDuck Manor, the triplets and Webby learn of long-kept family secrets and unleash totems from Scrooge's epic past, sending the family on an adventure of a lifetime to the Lost City of Atlantis. The voice cast is David Tennant (Doctor Who) as Scrooge McDuck, Danny Pudi (Community) as Huey, Ben Schwartz (Parks and Recreation) as Dewey, Bobby Moynihan (Saturday Night Live) as Louie, Kate Micucci (Garfunkel and Oates) as Webby Vanderquack, Beck Bennett (Saturday Night Live) as Launchpad McQuack, Toks Olagundoye (Castle) as Mrs. Beakley and Tony Anselmo (Mickey Mouse) as Donald Duck. Recurring guest voices include Lin-Manuel Miranda (Broadway's Hamilton, Disney's Moana and Mary Poppins Returns) as Duckburg's favorite hero Gizmoduck (his alias is Fenton Crackshell-Cabrera), Allison Janney (The West Wing) as Scrooge's old flame Goldie O'Gilt, Margo Martindale (The Americans) as the ruthless villain Ma Beagle, Paul F. Tompkins (Bajillion Dollar Propertie$) as lucky duck Gladstone Gander, Kimiko Glenn (Orange Is the New Black) as well-traveled teen Lena, Jim Rash (Community) as mad scientist Gyro Gearloose, Josh Brener (Silicon Valley) as tech billionaire Mark Beaks, Keith Ferguson (Gravity Falls) as Scrooge's archenemy Flintheart Glomgold, Eric Bauza (Marvel's Ultimate Spider-Man) as Beagle Boys and Corey Burton (Star Wars Rebels) as scientist Ludwig Von Drake. DuckTales is executive produced by Annie Award-nominee Matt Youngberg (Ben 10: Omniverse), with Francisco Angones (Disney XD's Emmy Award-nominated Wander Over Yonder) serving as co-producer and story editor, and Sean Jimenez (Disney XD's Annie Award-winning Gravity Falls) as art director. The series is a production of Disney Television Animation and carries a TV-Y7 parental guideline. Take a look at the opening titles for DuckTales below.